When we left you last week, we were headed down Route 100 from a visit to the top of Mount Mansfield, the highest spot in the state of Vermont. 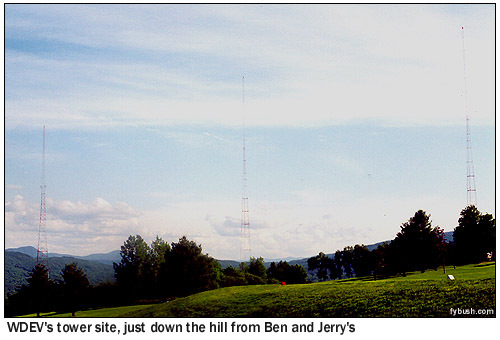 All that traveling can make a tower hunter hungry, so it was a good thing the ice cream windows were still open as we headed into Waterbury by way of Vermont's most popular tourist attraction, the Ben and Jerry's factory on Route 100 just north of I-89. And Burlington is where we're headed, having promised a look at its towers in last week's issue. We'll start up on the Roosevelt Highway (US 7) north of town, where we find the stick shown at the left. 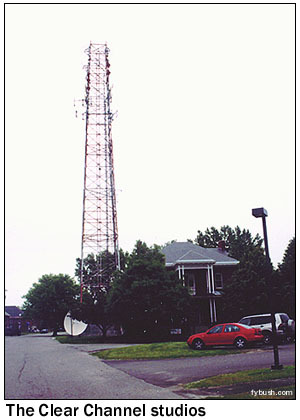 It's home to WXXX (95.5 South Burlington), one of the later entries on the Burlington-Plattsburgh FM dial. WXXX came along in the early eighties, originally operating on 95.3 as a class A facility with a top-40 format that has survived to this day as "95 Triple X." Back then, this was just a hilltop overlooking the highway; now it's an office park (you can see the edge of the parking lot at the bottom of the frame) that happens, by coincidence, to be home to the studios of Burlington Fox affiliate WFFF-TV (Channel 44). Heading south into Burlington, we find two AM stations in Colchester, on the northern edge of the city. Off Mallett's Bay Road is a long gravel road that leads back to the studios of WXXX and its sister AM station, WVMT (620 Burlington). WVMT is the oldest radio station in Burlington, dating back to the twenties and its beginnings as WCAX radio, ancestor of today's WCAX-TV, which we saw last week. Alas, we don't have any pictures of WVMT to show you. That's because the three towers of WVMT are way back in the woods and the water, at the edge of the bay far behind WVMT and WXXX's studio building, with plenty of trees to block the view. In the meantime, we can show you a somewhat mediocre photograph of another elusive site. 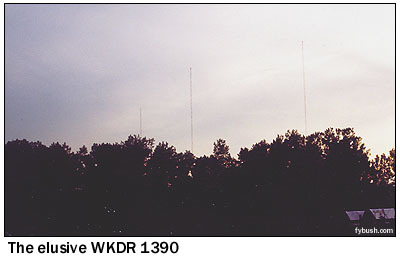 In the Intervale neighborhood of north Burlington, a couple of miles south of WVMT, are the three towers of WKDR (1390). This station started its life as WDOT on 1400, and was the big top-40 voice in Burlington "way back when." In the late seventies, it relocated to 1390 on the dial and boosted power to 5000 watts from the three towers shown at right. That's about as close as we could get, sorry to say; these towers are in some very low-lying lands behind a gate at the end of a dirt road through the Intervale, beyond some community gardens and a sewage-treatment plant that render the neighborhood air quite, um, fragrant. WDOT's 1390 facility changed hands in the mid-nineties, with the WKDR calls and talk format that had been in use across the lake at Plattsburgh's 1070 daytimer moving to 1390, which has maintained some variation of the talk format ever since. Today, WKDR is owned by Ken Squier, who also owns WDEV and several other Central Vermont stations. Head around Burlington to the east and you'll find yourself in the heart of Colchester, more or less, where the signs off Route 15 direct you into Fort Ethan Allen. 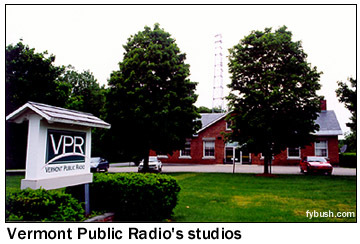 Three broadcasters have space in this former military facility: Vermont Public TV in a squat gray building, Vermont Public Radio in the former state police horse stables, now renovated into a state-of-the-art studio and office facility, and the Clear Channel stations just around the corner on Hegeman Avenue. The veteran occupant of this building is WEZF (92.9), which has been here since it signed on way back in 1969. Back then, 1500 Hegeman Avenue was also home to the studios of WEZF-TV, channel 22, which must have been something of a tight squeeze. 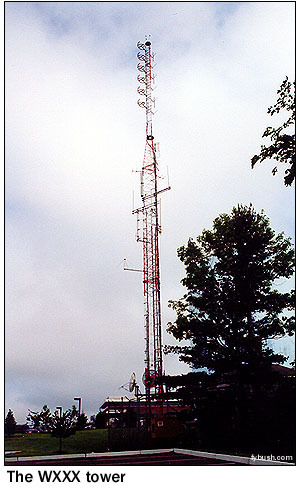 Today, WEZF has to share its space with sports-talk simulcast WEAV (960 Plattsburgh)/WXZO (96.7 Willsboro NY), smooth jazz WJVT (92.1 Port Henry NY) and classic rock "Champ 101" WCPV (101.3 Essex NY); the tower alongside the building holds STLs for all of them, as well as auxiliary antenna bays for the FM stations. Just down route 15 as you head back to downtown sits the campus of St. Michael's College, with easily-visible FM bays for WWPV (88.7), operated partially by St. Mike's students and partially by Vermont Public Radio, which uses WWPV as an outlet for its "VPR World Channel" news and talk service, also heard on the Web. There's not much radio in downtown Burlington these days, with the exception of the Burlington Broadcasters studio at the south end of downtown, home to WBTZ (99.9 Plattsburgh) and WIZN (106.7 Vergennes) and WRUV (90.1), the student station at the University of Vermont, so we'll head south instead, to a few facilities that hug the interchange of I-289 and US 7 in South Burlington. ABC affiliate WVNY (Channel 22) has studios at 100 Market Square (a former home of WCAX-TV), just off US 7 in a shopping-center area that's undergoing major renovation. When it's complete, you'll again be able to go out the back end of the complex and find your way to Joy Drive. That's where WCAX-TV (Channel 3) has its modern concrete studio building - but you'll probably be distracted by the tall tower just down the street. 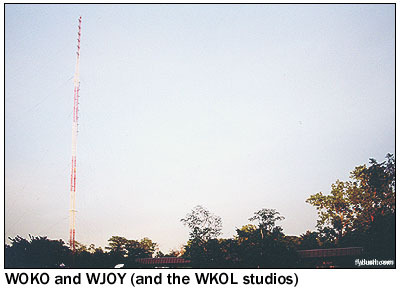 It's home to standards WJOY (1230 Burlington) and 100 kW country station WOKO (98.9), and the building at the base (just visible in this late-afternoon photo) is home to the studios of both those Hall-owned stations, as well as to sister oldies outlet WKOL (105.1 Plattsburgh), whose tower is in Peru, N.Y. across the lake. We'll make that trip across Lake Champlain (and back in time to 1995) next week, when we visit the stations of Plattsburgh. Join us then, won't you?